A few days ago MGR got a call from one of our members telling us that he attended the popular Minnesota Renaissance Festival in Shakopee and was shocked to see it had a “No Guns Allowed” sign at their entrance. I’ve attended the festival several times in the past but I’ve never seen that sign, so last weekend I decided to go myself and keep my eyes peeled! When I got to the entrance on Saturday I couldn’t spot the sign anywhere. Problem was, I wasn’t looking high enough! There, nearly TEN FEET up on a wall was the sign! 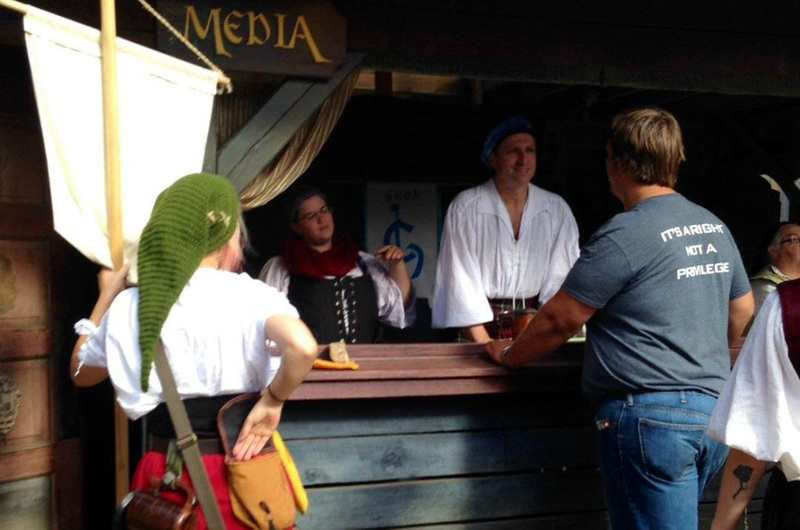 The Ren Fair board wants your money – but wants you and your family defenseless while spending time there. That criminals break laws and rules is pretty obvious to most folks. But not to the festival administrators! They prefer to ban folks like you and me – law-abiding, peaceful Americans fiercely partial to the right to defend one’s life – from defending ourselves and loved ones. 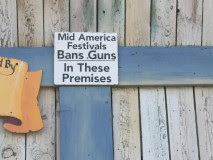 … but the Festival management ended up recreating tyrannical laws of old by making folks sitting ducks for any madman who ignores their “no-guns allowed” sign! So I tracked down a manager of the Festival and asked them why they’re discriminating against law-abiding citizens. The manager I spoke to, Carl, said that their lawyers told them to put the signs up. I reminded him that “gun free zones” (better termed “Criminal Safe Zones”) simply put everyone but the criminals at risk. His response was to laugh in derision at law-abiding gun owners. Worse, when I politely asked him to talk to his bosses at “Mid America Festivals” and relay our request that the signs come down, he adamantly refused! Gun owners love to spend their money where their rights are appreciated, respected, and upheld – NOT laughed at! • July 23, Lafayette Grand Theater: John Russell Houser allegedly opened fire with a .40 caliber pistol, -Two women in the theater were killed and nine were wounded! • July 16, Chattanooga: Mohammad Youssef Abdulazeez opened fire on two military locations–one a recruitment office, killing five and wounding three! • June 17, Charleston: An insane madman named Dylann Roof murdered nine people in a church service in Charleston, SC. Everybody knows the only way to protect you or your loved ones from a madman with a gun is with your own firearm. That’s why I’m asking you to take two minutes right now to call the Festival Office at (952)445-7361 or message them on Facebook by clicking HERE. Demand that they stop trampling out the rights of law-abiding gun owners and TAKE THE SIGNS DOWN! And if you could, please consider chipping in just $10 or $15 dollars to help Minnesota Gun Rights continue fighting for our gun rights in Minnesota. But please don’t wait! Call them right away. That’s most important. (952)445-7361! P.S. The Minnesota Renaissance Festival in Shakopee, MN proudly bans law-abiding gun owners from defending themselves and their families. In fact, they have a sign hanging on the wall by the entrances banning guns entirely from the premises! It’s no secret that criminals and madmen have a deadly history of targeting “Gun-Free Zones” to carry out their deadly crimes. That’s why I’m asking you to contact The Renaissance Festival administration right away at (952)445-7361 or message them on their Facebook page HERE and demand that they take their signs down! And if you would, please consider chipping in just $10 or $20 right now to MGR so that we can get more people involved in this fight to defend our 2A Rights. But please make the call to 952.445.7361 or message them on Facebook right away. That’s most important. I refuse to do business with any establishment that endorses NO GUNS ALLOWED.. I am not afraid to walk in,fill my cart and when approaching the check out mention to them that this is what I would have bought today but on account of your anti-gun sign I decided not to.Have a good day but not my business.